Amazon workers love Seattle’s Whole Foods. Here’s what some are saying about today’s bombshell news. It’s no wonder Amazon, looking for a better toehold in the grocery business, turned to Whole Foods. The chain’s South Lake Union grocery store is beloved by Amazonians. But what will it mean? They and others wondered about that Friday after the bombshell deal was announced. Paras Deshpande’s parents arrived from Mumbai, India, on Thursday. Early the next morning, the Amazon product manager took his father to Whole Foods Market. “I showed him around the fruits,” Deshpande said, walking out of the South Lake Union store with a bottle of milk and a bag of groceries. He knew his dad would be impressed with the variety, which is not so easily found in Mumbai. Here, all he had to do was walk across the street from his apartment. 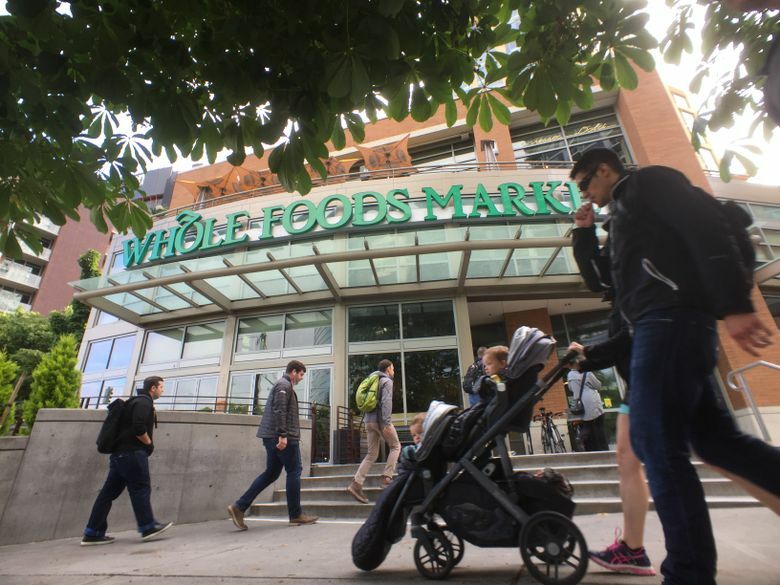 Whole Foods is very, very convenient to tens of thousands of Amazon employees working on the company’s South Lake Union campus, and often living nearby as well. They pick up groceries, stop by for breakfast and crowd the plentiful salad and hot-food bars at lunch. So Amazon’s bombshell acquisition of the high-end, organic food chain, announced early Friday, makes a kind of sense. If the digital behemoth wanted a better toehold in the grocery business, why not look at the grocer that is right under its nose? Still, when the South Lake Union store opened at 7 a.m., about an hour after the deal started making headlines, customers who hadn’t heard the news were surprised, and those who had were wrapping their heads around it. “Really?” asked Amy Shepperd, an employee of the global health nonprofit PATH, also headquartered nearby, who had just bought blueberries for breakfast. Her first reaction was positive. Amazon Fresh, the company’s struggling grocery- delivery service, doesn’t service her Edmonds neighborhood, and she said she’d love it if the acquisition changed that. Whole Foods, she noted, has a store nearby. “I’d be curious to see what happens with pricing,” she added. Amazon is known for prices on the low side, she observed. Whole Foods — sometimes referred to as “Whole Paycheck” — is not. “It would be great to see better pricing for some of the healthier, natural-food items,” Shepperd said. Amazon seems to value speed, she said, and that’s not necessarily consistent with wonderful customer service. “Speed is at the forefront of what Amazon does,” agreed Florentin Basaru, who works in sales for Amazon. He had stopped by Whole Foods for coffee and an almond croissant. And that’s exactly why he thought the Whole Foods purchase would benefit Amazon. “We are competing with the physical world,” he said. While Amazon has famously taken an enormous bite out of the brick-and-mortar retail business, those physical stores let consumers do something they can’t digitally: get something instantly in their hands. 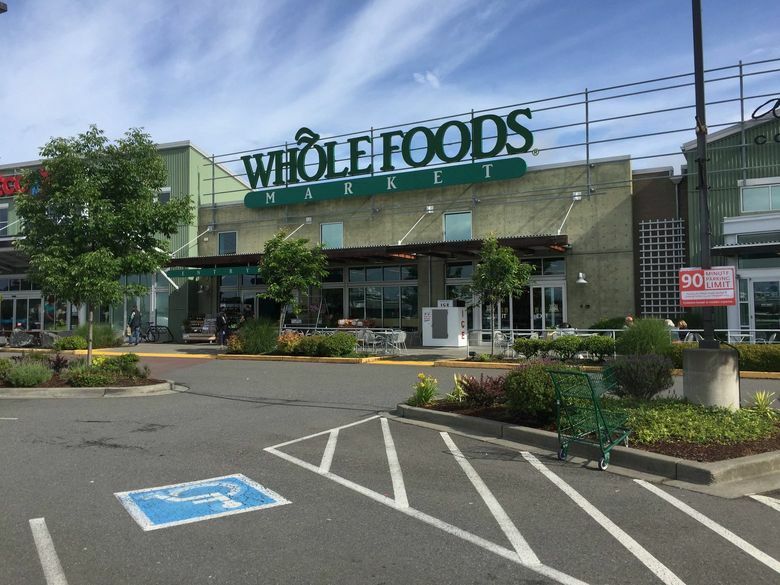 Perhaps, Basaru speculated, the acquisition would let consumers use Whole Foods stores to exchange or return items they bought on Amazon. Raj Mitra, another PATH employee, envisioned picking up sneakers he ordered through Amazon at the same time that he bought groceries at Whole Foods. He liked the idea, as he did the possibility that he might, as an Amazon Prime member, get a discount on grocery delivery. If that were the case, he said, he would try grocery delivery, though his bias was toward picking out produce and meats himself. “I just think it’s really funny,” he added. Amazon started as a digital alternative to physical stores. Now, it evidently feels that stores are worthwhile after all. “What’s old is new again,” Mitra said. Does that mean Amazon will own, like, everything — the digital world and the physical? “It’s going to rule the world, basically,” Toto Adefris said. “It’s a little bit disturbing,” said Adefris, an inspector for an insurance-services company, elaborating that a few companies are pushing the rest out of business. He worried about fewer choices and also about their impact beyond the business world — an oft-stated concern about Amazon and something the company seems to be thinking about, with its recent gift of space on its campus to a shelter for women and families and also to FareStart, which provides restaurant-industry training to the homeless and underprivileged. “Let’s just hope these big conglomerates are good corporate citizens,” Adefris said. At the Interbay store in Seattle, shoppers also had mixed reactions to news of the deal. Page Harader, 49, who lives in Ballard, says she likes to bring her kids to the store for a quick dinner. She’s curious to see what Amazon will do with Whole Foods and says she’ll likely still shop at the grocery store. “It’s probably good for Whole Foods because I heard it’s been struggling,” she said. Nina Shapiro: 206-464-3303 or nshapiro@seattletimes.com.